Experience extreme adventure with a dash of culture on this combo tour from Playa del Carmen. Soar through the canopy on a zipline, rappel your way down to the Maya jungle floor and snorkel at a cenote. 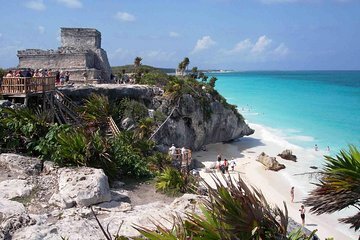 Visit Tulum, a walled Maya city perched on top of a bluff that offers spectacular views of the Caribbean. Enjoy a delicious buffet lunch and hotel transport on this 6-hour tour. Tulum was HOT, but magnificent! We went to Tulum first - had about an hour guided tour, followed by about an hour to tour and take pictures on our own. Then, headed to the Mayan Adventures property for lunch, zip-lining, rappelling, and a swim around the beautiful refreshing ceynote. Alejandro Alex was our guide at the Mayan Adventures site - he was funny, and fantastic. Our group consisted of our family of 5 and one other couple. A great day! Our tour guide Henry was great!! Very personable and knowledgeable We had a fantastic time!! Izzy and Raphael were great. We really enjoyed our day and would definitely do another tour with them. We had fun but I am not sure it's worth the cost. We stayed in Tulum and could have rented bicycles and gone their cheaper and at a better time of day. This is our biggest complaint. Also, we went to the zip line and repelling hen the cenote in the morning before lunch, just after lunch we went to the maya ruins and it was hottest and busiest part of the day. They should have planned for us to finish at the cenote to cool off I the afternoon.